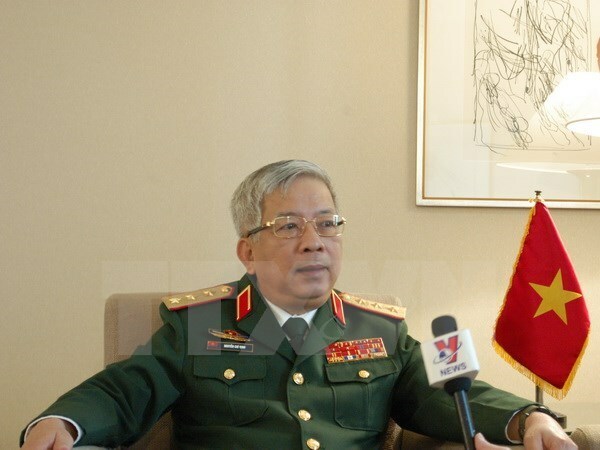 Hanoi (VNA) – Deputy Minister of National Defence Sen. Lieut. Gen. Nguyen Chi Vinh hosted a reception for Sounoura Kentaro, adviser to Japanese Prime Minister Shinzo Abe, in Hanoi on December 11. At the meeting, Vinh said defence cooperation between Vietnam and Japan has generated positive outcomes across many aspects over the past time, becoming a pillar of the bilateral strategic partnership. The two defence ministries have engaged in many joint activities, both bilaterally and multilaterally, exchanged high-level delegations, held many meetings for young officers, while joining hands in US peace-keeping operations, he said. For his part, Sounoura Kentaro said Japan will partner with Vietnam in the time ahead to deal with post-war consequences in Vietnam such as bomb and mine clearance, and dioxin remediation.